Disclosure: This is a sponsored post. All words and opinions are 100% my own. Did you know that November is Pomegranate month?! Don't worry you are not by yourself because I just learned this myself a few days ago when I was invited to cook with POM Wonderful and Momtrends. This was my first cooking event and this momma was very excited. comes to cooking I always love to try new recipes and my family always loves to try them out. 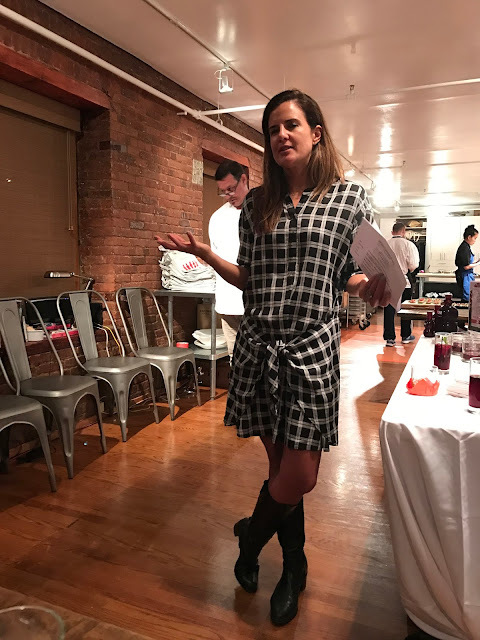 Being a picky eater has it's benefits because I've learned to never judge a book by it's cover and I definitely learned that during the cooking with POM Wonderful event. Always open your horizons and try new things, otherwise you won't know what you are missing out on. We were greeted with yummy cocktails and appetizers that all had the signature ingredient of the night, pomegranates. 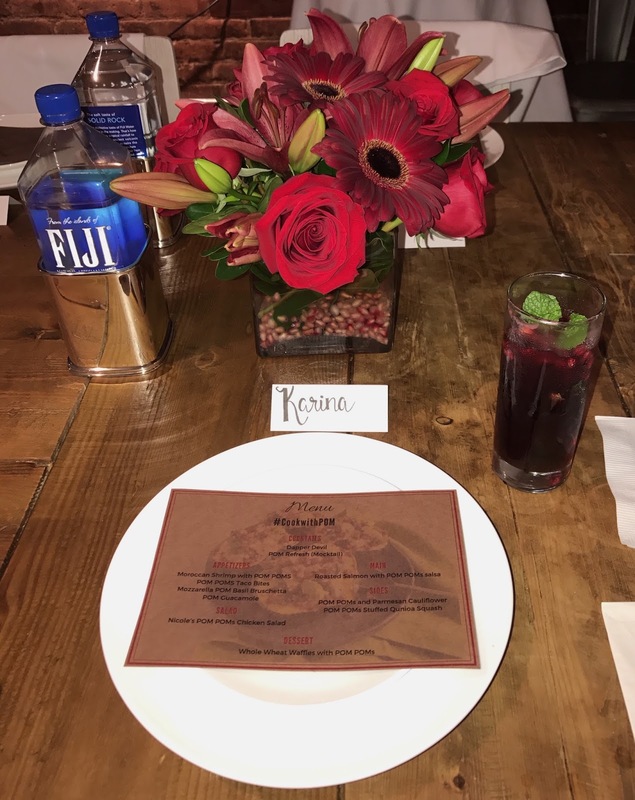 Not only that but the decorations were out of this world, from the beautiful red flowers to the fun touches of pomegranate. Who would have thought to put pomegranate arils in a flower vase, it adds that perfect pop of color to any table setting. After some mingling and filing my stomach to it's fullest with all of the yummy appetizers, we got to sit down but just for a little bit. and listen to the beautiful Nicole, founder and editor of Momtrends. She talked about our fun night that lay ahead, which got me even more excited for the holiday season that is just around the corner. It would be an on hand experience where we would be able to learn a new recipe, featuring pomegranate. There would be stations, each with a different recipe that we would learn to make, making it easy for us to re-create at home. 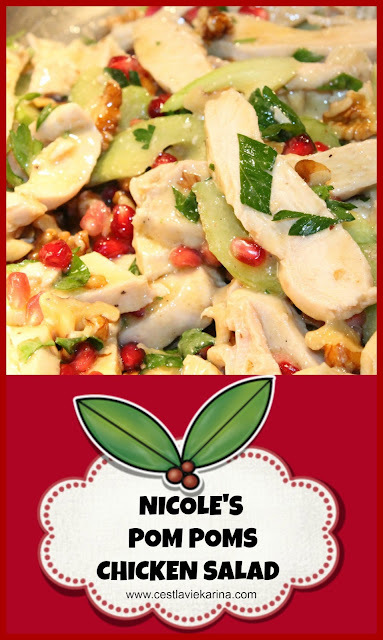 One of the stations featured a very special recipe, it was Nicole's (momtrends founder) very own recipe that she shared with us. I had to pick that one of course :) Salads are always a staple at any dinner table, it's a great companion to all foods and a must. It was time to cook and have fun, remember to always cook with love, everything will taste better. After some mixing and tossing, we were done. Yummiest salad ever, so colorful and full of yummy flavors. I even got to learn how to make my own honey mustard dressing from scratch, recipe below. Combine all ingredients, add dressing, toss. That only took a little bit of time and I got to learn how to make a yummy salad that is perfect for the entire family. After working up our appetite we got to sit down and enjoy our food that was made by some fellow bloggers and by professional chefs that were on location. Just look at the menu. The little bites at the beginning were already mind blowing, this menu had my mouth watering the moment I spotted it. Which was about 10 minutes into the event. You better believe that I was counting down until I could enjoy all of these savory recipes. You better believe when I tell you that I wanted to serve myself seconds of each. Just look at all the colors that the pomegranate arils provide. 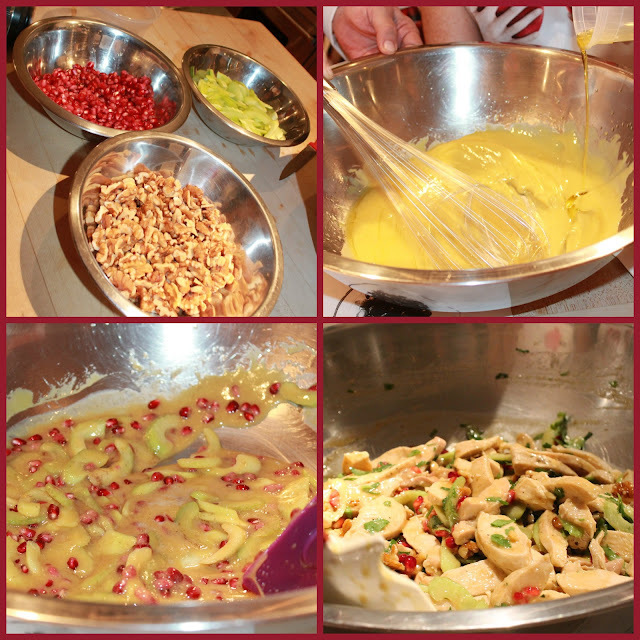 It was great to taste the pomegranate in some of the sauces used in some of the recipes. that's not counting the dessert. 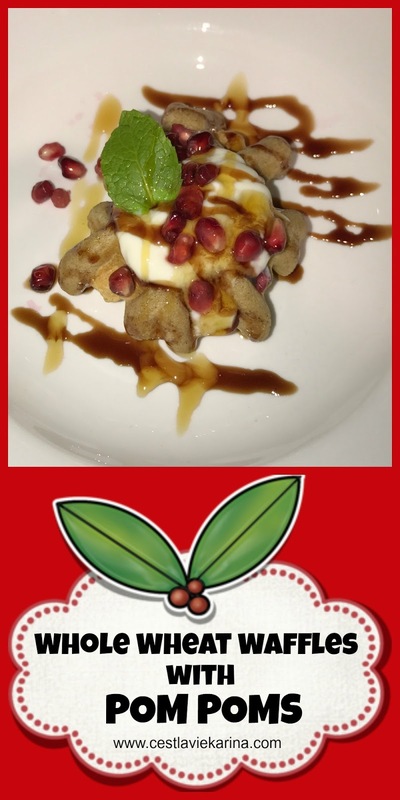 After finishing up my dinner for the night I couldn't help wishing that I could share with my family, that's why when I found out that we were given recipe cards with all of the dishes from that night I might have yelped a little bit. 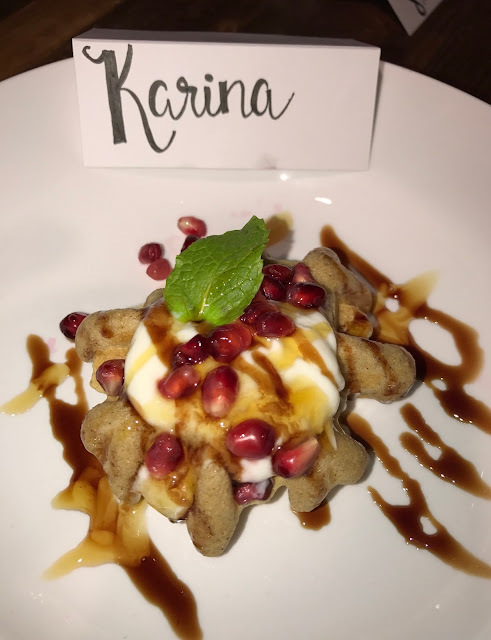 That meant that I could re-create these dishes at home for my family and friends and not only that but I can share a few with you guys as well. Here are just 4 of them. 1. In a tall glass muddle 10 large leaves of fish mint and 1/8 tsp of Pink Himalayan Salt. 2. 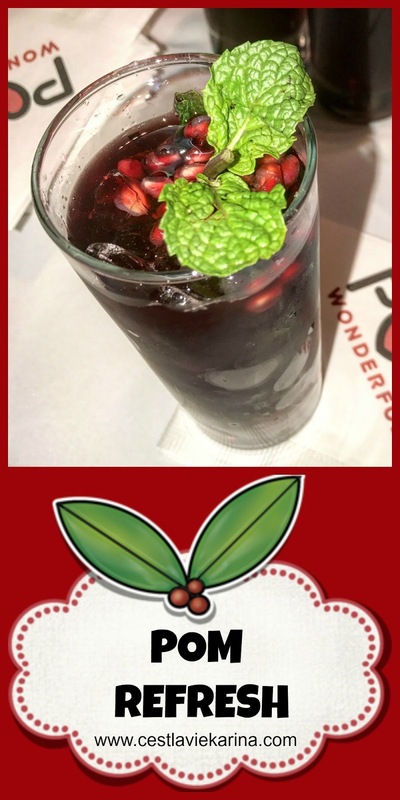 Pour in 6oz of POM Wonderful 100% Pomegranate Juice and 2oz of water. Stir to dissolve in salt. 3. Add ice and garnish with a fresh mint sprig and POM POMS Fresh Arils. 1. Whisk together 1/4 cup red wine vinegar, a pinch of salt and pepper, 1/2 teaspoon chopped thyme and 4 tablespoons olive oil. 1. Heat oven to 400'F. Microwave acorn squash until soft enough to cut, about 15 minutes. Cut in half stem to tip, and scrape out seeds. Place on a roasting pan and place on the upper third rack in the oven. Roast until tender, about 40 minutes. 2. Meanwhile, toss together the Brussels sprouts, onions, eggplant, mushrooms, olive oil, salt and pepper and spread out on a rimmed baking sheet. 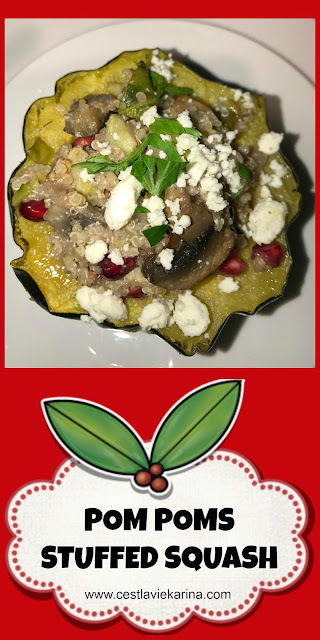 Place on the lower third rack of the oven under the acorn squash. Roast until tender, about 35 minutes. 3. 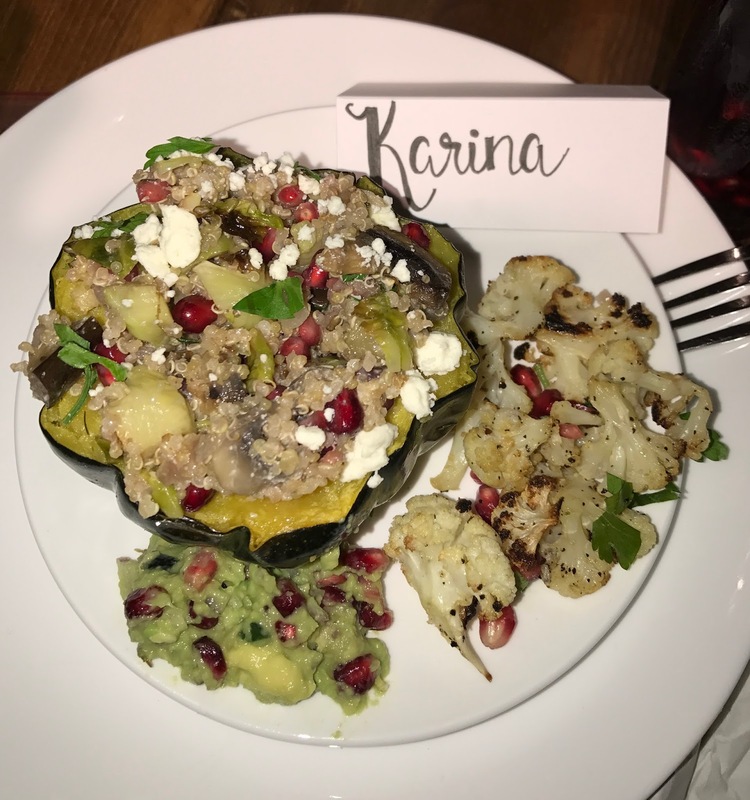 Toss roasted vegetables with quinoa, feta, POM POMS Fresh Arilsand half of the red wine vinaigrette. Spoon into acorn squash. Sprinkle with extra POM POMS Fresh Arils and serve extra vinaigrette. 1. For the sauce, in a pot over high heat, stir together POM Wonderful 100% Pomegranate Juice, sugar and lemon juice until sugar dissolves. Boil until liquid thickens and is reduced to 1 cup, about 45 minutes. 2. Meanwhile, toss shrimp in a bowl with cumin, coriander, cinnamon, salt and olive oil and stir to coat. 3. Heat a grill pan over medium heat. Add shrimp and cook 2 minutes per side until pink and opaque. Brush shrimp with sauce. Serve arugula on the side tossed with lemon juice and olive oil. 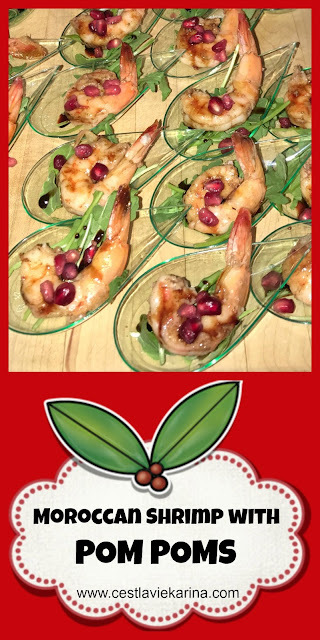 Top shrimp and arugula with POM POMS Fresh Arils for serving. Pour extra sauce in a small dish for dipping. 1. Heat waffle iron. Whisk together the flour, baking powder, sugar, salt and cinnamon in a bowl. 2. Mix together the milk, egg yolks and oil. In a separate bowl, beat the egg whites to firm peaks. Stir the milk mixture into the dry ingredients then fold in the egg whites. 3. Spoon 2 tablespoons of batter on the waffle iron for each waffle. Cook until golden and crispy. Place on a cooling rack immediately after removing from waffle iron. Top waffles with POM POMS Fresh Arils, yogurt and drizzle with honey. Here you have some yummy foods that are sure to wow your family and friends. Plus, they are so easy to make and it goes to show just how versatile pomegranates are. Now make sure to go out and enjoy pomegranates now that they are back in season. 23 comments on "Cooking With POM Wonderful #CookWithPom #Ad"
I have never cooked with POM but that chicken salad looks pretty delicious! I love going to event like these where you can sample great dishes and take home lots of ideas! This sounds like so much fun! That chicken salad looks delicious! I wouldn't mind devouring a few of these dishes! I've never heard of this, I will check it out. Everything looks great! It looks like you had a great time! 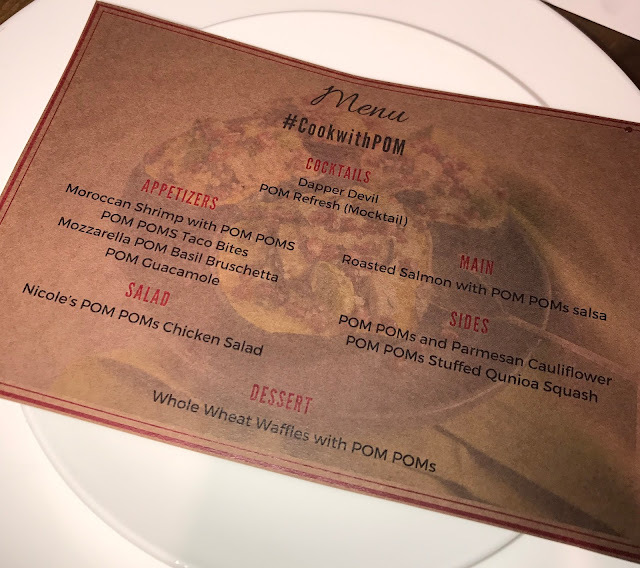 Ok, not to sound completely clueless - but I never heard of recipes with POM. I LOooOOve POM and am super curious about trying this recipe! Looks so yummy! I never knew you could make so much with it. But these are a great way to incorporate that flavor! 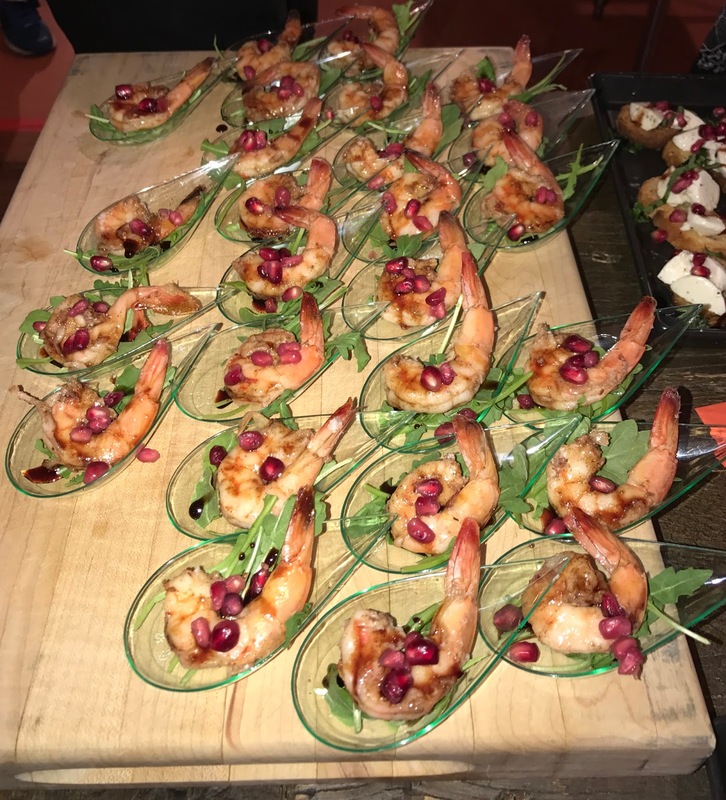 Yum, those Moroccan shrimp and chicken salad look wonderful. I never would have thought to use Pomegranaterate juice in these. We LOVE POM!! Even my kids will sneak a glass when I have it in the fridge, who knew you could make so much with it! Wow! Everything looks and sounds delicious. I'll be saving all these recipes. I want to try the Moroccan Shrimp first. We love cooking with POM. We enjoy the tartness that works well with a variety of flavors. I am wanting to try your salad dressing. I think I have the perfect fall salad it would go with. Oh my gosh I love drinking POM, but had no idea to cook with it! I am definitely making the Honey Mustard Dressing with it! I love drinking POM or eating pomegranates but I never actually thought about cooking with with it! There's recipes look amazing, I can't wait to try the Moroccan shrimp, looks so good! I didn't know you could cook with POM. I know their drinks are tasty, but I didn't realize that you could cook wit them too. That is great news! I have never used POM before, but that salad dressing looks amazing! I love to make my own, so I will definitely have to try this! Ok I have drunk POM but never cooked with it before! And I happen to have a bottle of POM and an acorn squash! Thanks for the inspo! POM juice is one of my faves but I never thought to cook with it! What a great idea! These all look lovely! Yum, this all looks so tasty! I wish I had some POM juice in my house now. What a fun looking event! Ooooo I just love drinking POM but never thought about actually cooking with it!!! I will have to give POM a try as an ingredient! I love POM!!!!! I keep it stocked in my fridge at all times! It is delicious but I never even knew that I could cook with it! What an awesome idea! 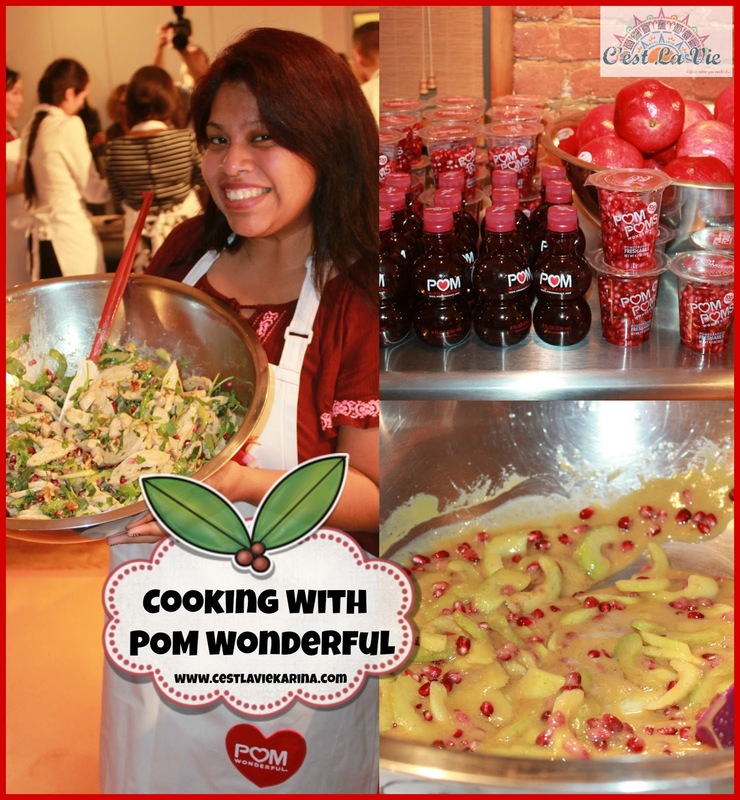 I LOVE Pom, but had never thought to cook with it! These recipes look fabulous...Pinned! I didn't know pomegranate had its own month. I also never would've thought to try cooking with it either! Everything looks yummy! I love POM but have never cooked with it. These recipes all look so good! I don't believe I have tried this brand before. However, I'll have to keep it in mind the next time I make Basil Bruschetta, which I haven't had for ages! I LOVE Pom Wonderful! SO tasty! I never thought to cook with it!